TBILISI, DFWatch — Germany’s foreign minister Guido Westerwelle says he hopes the change of government in Georgia won’t influence the country’s course towards NATO and the EU. Westerwelle said this ahead of a meeting of the NATO-Georgia commission, which met simultaneously as a meeting of NATO foreign ministers in Brussels. He said that Germany wants Georgia to follow a successful, democratic and pro-Europe course and Germany wants to support it in its democratic developments as an important partner. NATO informs through its press office that the alliance encourages all parties in Georgia to keep up the momentum of the recent elections and to consolidate democratic progress. “We encourage all parties to work together to keep up that momentum, to make co-habitation work, to continue to pursue the necessary reforms and to meet the highest democratic standards, including full respect for the rule of law and the constitution”, Anders Fogh Rasmussen, NATO Secretary General remarked. 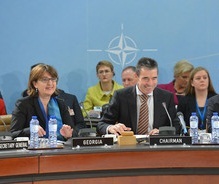 After successfully holding parliamentary election October 1, NATO names the presidential election in October 2013 as the next test of democracy for Georgia. “Georgia is a close and committed partner for NATO. Recently, Georgia doubled its contribution to our mission in Afghanistan to become one of the biggest troop contributors to ISAF of all our partners”, Secretary General noted.